Summer is my favourite season and for good measure. Nature is at its resplendent best, the outdoors are inviting to explore and cultural events reach a crescendo. So why not the flavours on our plate? 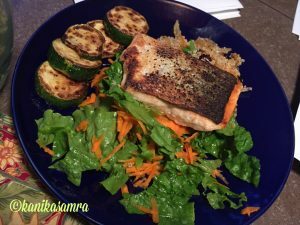 Salmon and Quinoa – A Summer Meal Done Right! Well, actually, they do too. One of the finest examples is Salmon. The peak harvest time for wild salmon from the Atlantic, Pacific Northwest and Alaska is between May and October. Atlantic salmon, an endangered species, are off-limits for fishing. So, Atlantic Salmon in grocery stores are farmed salmon. Needless to say, any food that once becomes part of a production process, can flood the market faster than what is found in the wild. Farmed salmon of the Atlantic kind is most commonly found in stores across USA. I bought a filet that was between 10 & 12 ounces i.e. ~ 340 grams. Halved, it provides the recommended portion for two people. Read on to find out how to quickly assemble a mouth-watering summer meal. Patting it dry on paper towels. Most store-bought meats in America are fairly clean, de-boned and ready to use. But when you buy fish (or for that matter any other meat) from the butcher counter, it is often sitting on ice. I’d like to believe its sanitary, but to be sure a bit of cleaning at home is important. First, salmon can be cooked with or without the skin. For this recipe, I am describing filets cooked with the skin on. So all you need to do it inspect the fish up close, give it a gentle rinse in cold water and then pat dry with paper towels. Next, if like me you bought one big filet, cut it into two equal pieces. Use a sharp knife. I found it easier to cut with the flesh facing up. In the skillet – cook skin side first. Put a heavy bottomed frying pan on the stove and let it heat up before adding oil/butter to it. In the meanwhile rub salt and pepper on both sides of the fish. If you are fond of garlic, then you could also chop two to three cloves and saute them in oil. Once the pan is ready, add oil to it. Coat the base well. Add salmon skin side down, ideally it should sizzle. Reduce the heat to a medium. Cook until you see some of meat just above the skin turn pale- almost white. Flip and cook on the other side for a few minutes ~ 5. But, eyeball it to make sure you don’t overcook. The best test for cooking any fish in addition to change in color, is to check for flakiness. That’s the point at which you need to take it off the heat. I served salmon with a side of quinoa, sautéed zucchini and a carrot, mint and spinach salad. To save time and prevent salmon filets from getting cold, prepare the salad and quinoa ahead of time. For zucchini, I did not change the pan or oil. I added sliced zucchini to the same oil in which salmon filets were cooked. Season it as you cook, 3-4 minutes a side, at medium-high heat. Once browned, take it off. It’s best to prepare quinoa before even getting to salmon. To get started measure quinoa and clean it. Wash it in cold water. Quinoa can be tough to manage when wet. Once you have filled a bowl of quinoa with water, gently rub with your finger and then use a large sieve to filter it. Run some cold water through quinoa in the sieve, let it sit to drain before cooking. Use a large pot to cook quinoa. Put it on the stove and heat some oil, to that add garlic and onion. Saute until light brown. Add salt and pepper followed by quinoa and 1 cup of water. Cover and bring to a boil. Then lower the heat and let it cook until you can see white strands in quinoa grains and all the water had been absorbed. Roughly chop some roasted peppers (broiled in the oven/OTG until the skin is charred) and mix into quinoa before serving. You can garnish this with some mint and a light squeeze of lime. Shredded carrot and lettuce salad along with a bowl of hot quinoa. I made the easiest salad ever! Grate carrots and transfer to a bowl. Add chopped salad greens of your choice. Then in a bowl whisk some extra virgin olive oil (1-2 tsp), with 1 tsp lime juice, salt and pepper and a pinch of sugar. You can instead use any dressing you like. Toss everything and your meal is ready. Plate salmon on a bed of salad and quinoa. Once you bite in you’ll be surprised how little seasoning good fish needs. Enjoy your fresh, protein packed meal! 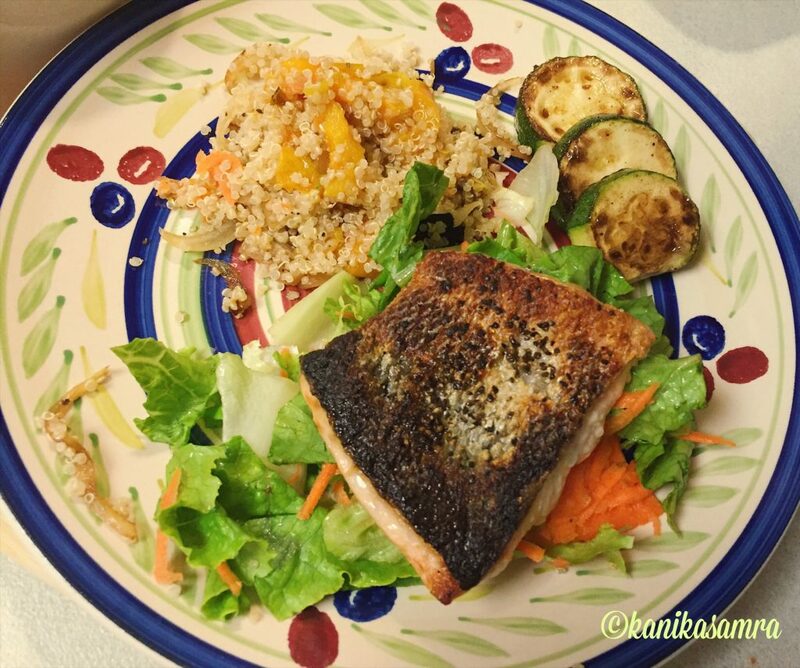 A delicious summer time meal that combines the best flavours of the season - Salmon and vegetables with Quinoa. This recipe uses skin on filets of Salmon. Inspect the fish up close, give it a gentle rinse in cold water and then pat dry with paper towels. If like me you bought one big filet, cut it into two equal pieces. In the meanwhile rub salt and pepper on both sides of the fish. If you are fond of garlic, then you could also chop two to three cloves and saute them in oil. Once the pan is ready, add oil to it. Add salmon skin side down, ideally it should sizzle. Reduce the heat to a medium. Cook until you see some of meat just above the skin turn pale- almost white. Flip and cook on the other side for a few minutes ~ 5. Once the fish is cooked, remove from the pan. Use the same pan and leftover oil that was used for Salmon. Season it as you cook, 3-4 minutes a side, at medium-high heat. Once browned, take it off. It’s best to prepare quinoa before even getting to salmon. Measure quinoa and wash it in cold water. Use a large pot to cook quinoa. Put it on the stove and heat some oil, to that add garlic and onion. Add salt and pepper followed by quinoa and 1 cup of water. Then lower the heat and let it cook until you can see white strands in quinoa grains and all the water had been absorbed. Roughly chop some roasted peppers (broiled in the oven/OTG until the skin is charred) and mix into quinoa before serving. You can garnish this with some mint and a light squeeze of lime. Grate carrots and transfer to a bowl. Add chopped salad greens of your choice. Then in a bowl whisk some extra virgin olive oil (1-2 tsp), with 1 tsp lime juice, salt and pepper and a pinch of sugar. Toss everything and your meal is ready. Plate salmon on a bed of salad and quinoa. Quinoa can be tough to manage when wet. Once you have filled a bowl of quinoa with water, gently rub with your finger and then use a large sieve to filter it. Run some cold water through quinoa in the sieve, let it sit to drain before cooking. Thank you Liz! 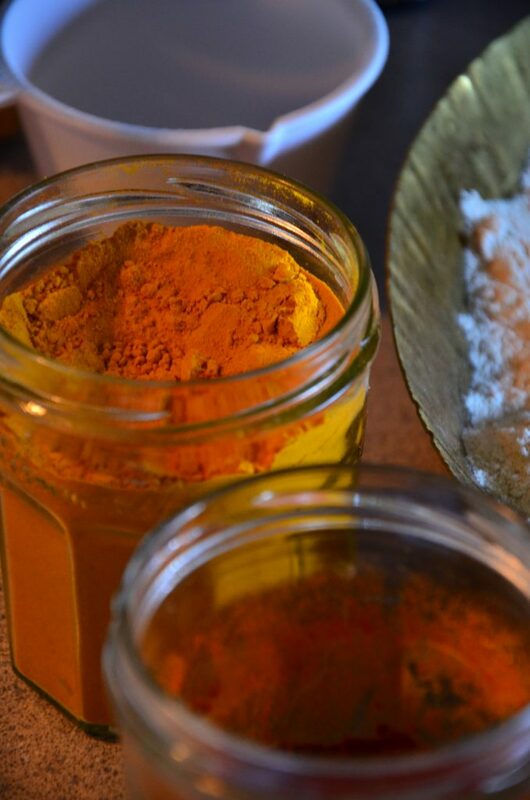 Your recipes are such a blend of fun and creativity!